Have you ever been called out by your coach for not working hard, lacking intensity, or not playing up to your ability level? Criticism from your coach can be perceived as harsh–even embarrassing–especially when it takes place in front of your teammates. Even constructive criticism from your coach can affect your confidence, motivation, effort and, ultimately, your play on the ice. Sometimes, you might feel like you are being singled out or fear you might be benched. When you react negatively to criticism your mindset changes, your physiology is altered and your play on the ice is negatively affected leading to more potential criticism. By internalizing the criticism, you will, most likely, play tentatively. You may fear one mistake will bring on more criticism so you play it safe rather than playing aggressively. Playing it safe will not help you play to your ability. No matter the tone or content of your coach’s criticism, you need to learn how to deal with or process the criticism so you will be better able to maintain your confidence and focus on the ice. Defenseman Kevin Shattenkirk of the New York Rangers was recently called out by his coach for under performing. Shattenkirk was a huge free agent acquisition last summer for the Rangers and was expected to make a big impact this season. Shattenkirk has five goals and 17 assists in 38 games and is on pace for his lowest offensive production since 2013-14. Shattenkirk even had a stretch of 11 games where he only had two points. Rangers coach, Alain Vigneault, has called Shattenkirk “a work in progress” and has publicly noted that Shattenkirk has not lived up to his potential. Shattenkirk often compounds criticism by becoming self-critical which further hurts his game. Shattenkirk has decided to focus on his game rather than the criticism itself. Criticism may hurt but it is one person’s opinion and it may have some degree of truth. If you learn to sift through the delivery and some of the negative language, you may find some useful information that can improve your game. You see, criticism is not always negative. There may be good positive feedback that you can utilize to play better on the ice. You just need to not allow the delivery to negate the message. Don’t allow the tone taint the value of the message. Don’t take it personally–as an attack on your person. Focus on the part of the message that can help improve your play. Don’t allow criticism to be destructive. Criticism can be constructive if you look at it the right way. 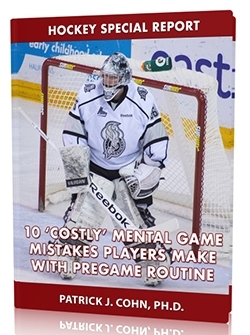 Learn Mental Game Strategies to Boost Your Confidence in Sports! If you’re an athlete who struggles with self-doubt, loses confidence, or cant take “practice confidence” to competition, The Confident Athlete is for you! You can tap into my knowledge and experience to learn how to bring ultimate confidence to competition! 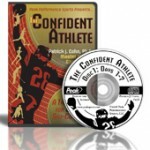 The Confident Athlete CD and workbook program consists of 2 audio CD’s that include 14 days of confidence fueling exercises and a simple to follow workbook that guides you through the 14 days, helps you apply the strategies and customizes the exercises to your personal needs. Remember, confidence is a choice you make. You have to make a conscious effort to proactively seek confidence building thoughts and behaviors. Confident Athletes are proactive when it comes to confidence! Take control of your mindset and performance today! What are mental game customers saying about our confidence boosting program?